Over the last couple of weeks I’ve been battling with a niggling issue of wobble from the front end. I’ve had the wheel re-balanced, kept checking tyre pressures, but never really resolved it. I was about to dismiss it as my large top box and rear tyre starting to square off. However throughout my front tyre has always needed a bit of air each week. This last week however, it quickly became apparent that I had a slow puncture. 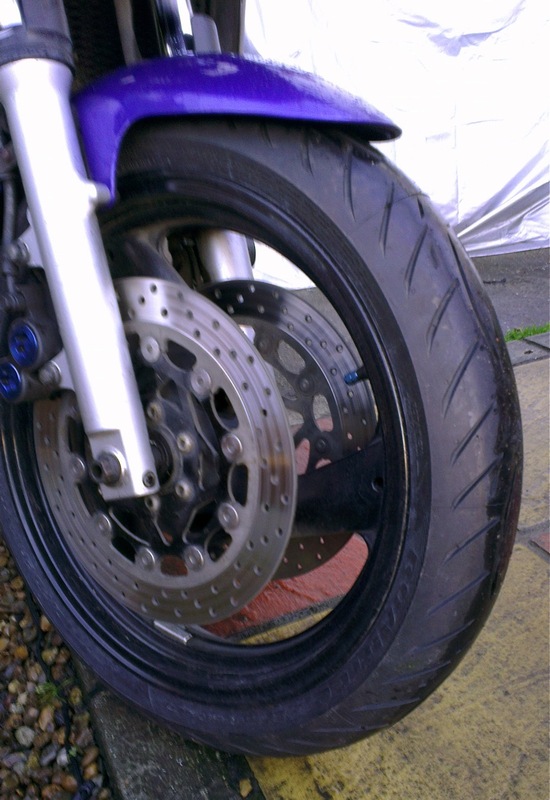 My old Metzeler Z6 tyre was nearly a year and half old and showing only a couple of mm left, so I ordered a new tyre, whilst I could still ride about. That was until one morning I found it totally flat. Hoping I could pump it up enough to get to garage, I found air hissing out of the valve like crazy. Yes, the valve, there was no hole in the tyre – Doh! After a quick trip to Halfords to pick up a valve tool, it turned out the valve core was super loose. Quick tighten and the tyre held up well. Hmmm, but what to do with the new tyre on order? Decided to swap anyway, the old Z6 would have only last a couple of months and I was keen to try out the new Z8. Ultimately, on two wheels we need as much grip as we can get, it’s a false economy running rubber until the very end. Moral of the story, got a slow puncture, check the bloody valve first!